The search for two people onboard a Robinson R66 helicopter which went missing between Sudbury and Kapuskasing, Ontario, has ended with the discovery of their aircraft. At its height, the search involved: 7 Royal Canadian Air Force (RCAF) aircraft; a Canadian Coast Guard (CCG) helicopter; and 3 Civil Air Search and Rescue Association (CASARA) aircraft flown by volunteers. Personnel and aircraft from: 424 Transport and Rescue Squadron, 8 Wing Trenton; 435 Transport and Rescue Squadron, 17 Wing Winnipeg; 439 Combat Support Squadron, 3 Wing Bagotville; 405 Long Range Patrol Squadron, 14 Wing Greenwood; as well as the CCG and several CASARA volunteers both on the ground and in the air. Approximately 85 RCAF, Canadian Coast Guard, and CASARA personnel took part in the search. Unfortunately, when RCAF Search and Rescue Technicians (SAR Techs) arrived on scene, they were found without vital signs. The missing helicopter was discovered by an RCAF CC-130 Hercules at 1:22 p.m. EDT and deployed SAR Techs from a RCAF CH-146 Griffon helicopter at 1:54 p.m. EDT. The Ontario Provincial Police (OPP) and Transport Canada have been advised and the OPP has taken control of the crash site. The Transportation Safety Board will be launching an investigation into the cause of this crash. The helicopter with two people onboard was initially reported missing Wednesday, March 6, after their family contacted the OPP. They had been flying from Sudbury to Kapuskasing, Ontario. 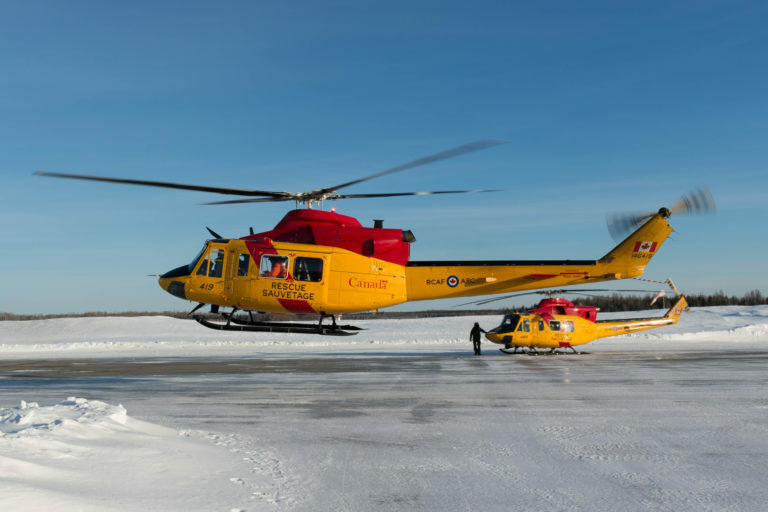 Joint Rescue Coordination Centre Trenton began the search with RCAF aircraft and Civil Air Search and Rescue Association (CASARA) personnel on Wednesday March 6, and it was upgraded to a major SAR operation on Saturday, March 9.